I’ve taught writing in both public schools and private settings. Years after their last lesson with me, I asked two very bright sisters (with diametric learning styles) what they remembered from their long season with me. Both answered, “Save spit.” Turned out, the pithy injunction had velcroed itself on their brain and conducted the papers they went on to write in college and high school. 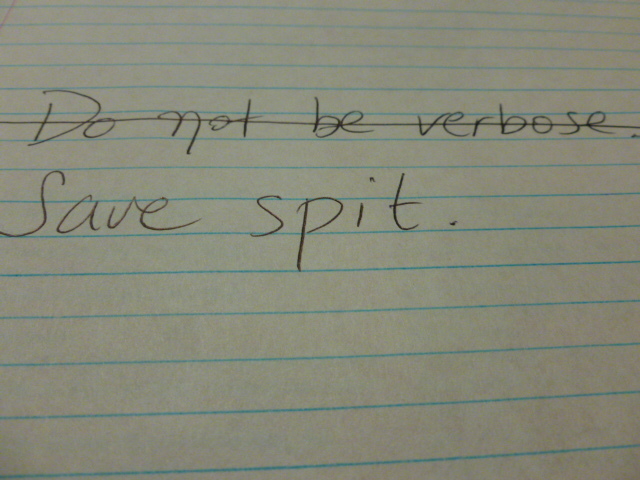 Save spit is one of my top writing protocols. I shave as many words as I can and go back and cut some more. Brevity isn’t so much my goal as conciseness. You’re allowed to spin 2000 words on a subject when it begs amplification or because you need to reach every milepost of reasoning for a crisp presentation. Smooshing those thoughts into 1000 cloudy words is not what I mean. What I do mean is simply word economy in as much as it is possible. My private students hated being made to trim the verbiage. My private students hated trimming the verbiage. “The teacher wants 500 words in this essay. How’m I gonna reach that? !” Of course it was the clear thesis, rich elaboration, cogent arguments that would satisfy the length requirement. And when you’re not writing to satisfy a quota is when you’re really writing, isn’t it? It is not only hard but pretty impossible, actually, to isolate a writing principle. Like anything that breathes, the writing process is an organic movement much like a dance – of the technical and the artistic. So there are plenty of moments when you’ll favor one guiding principle over another. Paint a picture, for instance, is another mantra I write by. Sometimes I choose an extra few words to this end. I started writing again. vs. I blew the dust off the pen in my head and picked up my beloved writing again. Both work. The first sentence not only boasts efficiency but encourages curiosity for what is to come. The second, while blatantly injuring my sacrosanct dictum of word economy, paints a picture and evokes a feeling entirely absent in the other sentence. So writing principles are not commandments. Saving words does not mean being dry. You want flowers, meaning beauty, in your writing – without being flowery. Boundaries meld to your oneness, while husband and wife remain distinct. It is a mystery. Ewwwhh! *Finger in throat* Augh! God bless the gracious readers who put up the like on that one. Each time I look back, the more vigorously I shudder at the melding. Boundaries in oneness, a mystery. I return to old posts with a fresh eye and a pair of shears, and clip what I possibly can. I don’t want clutter in the path of my readers. I try to keep it tight, so that the words hug the intended meaning. This entry was posted in Arts, Writing and tagged Blog, Blogging, Creativity, Efficiency, Homeschool, Poem, Poetry, Words, Write, Writer, Writing Process, Writing Technique. Bookmark the permalink. I am a very emotional writer, so painting a picture is very common in my style. However, I am also learning that not every sentence needs to pain a picture, and that succinctness at times can be just as effective as trying to be artful about, say, a metaphor of death. I’m not trying to criticize, but do you proofread while you’re saving spit? Sorry, that is an old habit I have due to the fact I have to proofread my Pastor’s blog every week before I post it. Why do you ask? I proof helplessly, at every stage – and often go back even a good while after posting. Thk you for the follow. So interesting! Even (esp) your self-awareness as an emotional writer. Yep. The science and the art. Balance. I hope you got to part 1…bc it speaks of emotion, in its own way. Thank you for chkg out….SO glad to be talking with you. And I love the ballet pic. “Of course it was a clear thesis, rich elaboration, cogent arguments that would satisfy the length requirement. And when you’re not writing to satisfy a quota is when you’re really writing, isn’t it?” Yes! And I’m coopting “Save spit”! The kids will love it and as you heard from your students, they’ll remember it. Thanks! I almost did talk about famous unconcise writers — but I knew with confidence that unless one really knows what’s what and can masterfully play with the rules, cutting the fat is the way to go. Thanks for the input. Well noted – from a veteran homeschooler. I like that we found each other, your advice on writing will be something I enjoy reading, and probably very helpful. Some of my writings are wholly emotional, and while I might be able to cut it down, some of the emotional processing requires the frustration to be elaborated…because I NEED to see it, I NEED to write it. I need it to be seen as it was felt at the moment. But then part of my effort is about the struggle with PTSD is about illustration of the reality. But you are absolutely right here, and I’m very glad to have your shares when you comment. The way you linked me to this post, was very thoughtful, unassuming, and well considered. “Brevity isn’t so much the goal as conciseness. (…) And when you’re not writing to satisfy a quota is when you’re really writing, isn’t it?” – I also like Stephen King’s formula, which I only discovered first a few months ago. 1st: 40,000 – outline of the story and some key scenes written. 2nd: 80,000 – storyline gaps filled. Post-editor feedback: 3rd: 115,000 – added description, characterisation and a couple of explanatory scenes. Then the novel took a break as I started the gruelling PhD process. I simply could not afford the time to re-work it, or so I thought. In August I returned to it for the first time in years. I realised that it missed one essential component: the backstory. Because of this, it could not be what I had intended it to be, so… pen in hand (and yes, I actually did it the old-fashioned way this time) I wrote the main character’s backstory: another 30,000 words. So… now I have a mammoth draft of nearly 150,000 words for a novel that really ought to be no more than 100,000. I reread my draft with a black pen in hand and cut, cut, then cut some more. At times whole pages had to go, because it was just me (the author) ranting about things that simply added nothing to the story. This first re-reading got the word count down from 145,000 to 103,000. Since then, using King’s formula, I have been able to shave off another 7,000 words. I do not miss them. It was surplus: phrases that could be cut down to a concise sentence, paragraphs that had the same fate, adjectives and adverbs have all become outcasts unless they can justify their presence, dialogue handles have been made invisible figuratively in some cases, literally in others. It is liberating. It does wonders for pace. Even the plot gained more clarity as a result. I’m half way through with the revision at the moment, but I am hopeful that at this rate I will have a tight final version at the end of it. Thank you for sending me the link for this article, Diana. I enjoyed it, and it reminded me of a couple of ground rules. Even when we do know, it is always helpful to remember. Thank you, Diana. Kind and generous as always. It was a case of thinking through your article and using my own experience to do it. 🙂 You know what… that funny bone I was telling you about. Sometimes it works with me, other times without. I agree with you on brevity in writing When used correctly it’s more powerful and has more impact. With conciseness the reader’s mind does not get side tracked by a waterfall of words but stays focused on the subject. =) Dear of you to leave your feedback, F.
=) Love the quote, Andrew! And the proposal that “the student who can make the same point in 25% fewer words should be encouraged rather than punished.” Thank you for keeping up. I absolutely love this. I go back to old posts and trim the verbiage where possible. It’s funny that you mentioned painting a picture. One of writing books I picked up was called “Word Painting.” Another one called Pencil Dancing. Don’t ask me specifically what they are about…I tend to collect more books about writing than actually read them, which is bad, I know. That was interesting. I constantly work on my word creations, sometimes dragging out of files old works to reengineer. The idea of reducing to essence is helped along by journal or news submissions. Publishers like Readers Digest want the story concise and to the point so you have to spend more time on such submissions than you do on a novel. lol, I don’t claim to be a literary genius and am not up on ideal punctuation. I leave that to the experts. I believe it was Twain who said if he’d had more time, he would’ve written a shorter letter. I have seen this before, and still have trouble figuring out how to do it. Will make another stab at it, once I finish the book I’m writing right now. Thank you for your lessons, we do need them! I cannot tell you how much I treasure “On Writing” as well, Stephen has been my very favorite author since I read “The Eyes of the Dragon” when I was 12 years old. I especially love his story about when he blew the electricity in the whole town as a kid. Sometimes though, I wonder today if the older writing rules still apply, or can we be ourselves? I know sometimes I could trim 90% of what I said, but some of it is me being me, so is that wrong? Am I losing my reader then? For instance one of my recent posts where I reviewed some shows. I know I could of deleted a lot of crap that I didn’t need to add, but I kept it anyways cause its kind of me and my style.. but honestly, is it wrong – or maybe wrong is to vague. Is it defamatory to my purpose, of getting my writing self out there? I wonder about that. In a sense, I justify it as art. This is what Laura is saying. But really, should I follow the proper writing world’s way? I honestly ask that, and can handle the criticism. Also, truthfully, I edit so many times I get crazy and just have to hit publish. Then I edit about 15 more times after rereading it and finding still more errors.. ugh. Probably if I didn’t say as much silly crap I’d have less editing errors. Well I will not continue to ramble any longer! whew… glad to hear. I kept my writing “in the closet” most of my life.. this blog is my first “putting it out there..” and I do wish to grow. I also appreciate your comment about justifying it as art. And maybe I see when it is and is not, a thought came to me that if I was writing fiction, per say, and going off like that, or, if I was limited to so many words, as you spoke of, I do think I know where and when to word better. I know you weren’t speaking of losing self, but you prompted a thought I had and since you are obviously very knowledgeable (I was gonna say expert but I knew you’d say no your not) I threw that out there with my question/comment. Thank you so much for your reply. or just “Hollistic Wayfarer”…(*Sigh what a tough name…I don’t even know its meaning….I mean I don’t even know your real name…What should I say to you…You once said don’t call me aunt…so IDK…what should I say? HA ha ha ha. Was she a hitwoman? Na…..She gave assignments to the Hitman…..Himan is my favorite game series…..Totally love it…..
LOL. I’ll take that. Give assignments to him. He he.